Following my previous post on planning the Welsh 3000s jaunt, we have done it! The live track and Twitter feed seemed to work well, thanks to all of you watching and sending messages of support. I wasn’t able to start the live feed at the very start due to no phone signal, however I have now joined the non-live and live bits to form the complete track here. You’ll probably have noticed a few times when the track wasn’t moving, this was due to lack of mobile network coverage, however in general the coverage seemed to be a lot better than at home! 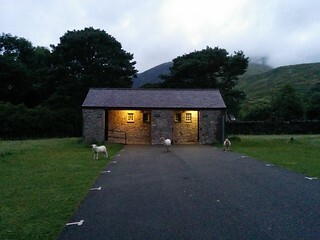 It was somewhat tricky to sleep the night before and I was up at 02:50 am before my alarm went off, so we were on our way to Pen Y Pass on time, and set off at 04:23 BST with the moon vaguely visible through the cloud, and with no daylight wasted. Setting off up the deserted Pyg Track we caught a few glimpses of the peaks ahead before the cloud rolled in and as we started the ascent of Crib Goch we were in the cloud. 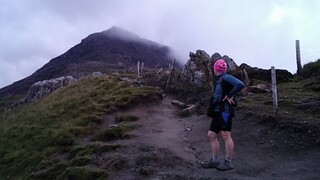 It was good to be fresh at this point and we made good progress up Crib Goch and along the ridge, there were no tricky moments, but I think that it is a good idea not to stop and contemplate the route too much when going along the ridge. Around Carnedd Ugain visibility was rather poor, but no real dificulty with finding the way on this well trodden route. 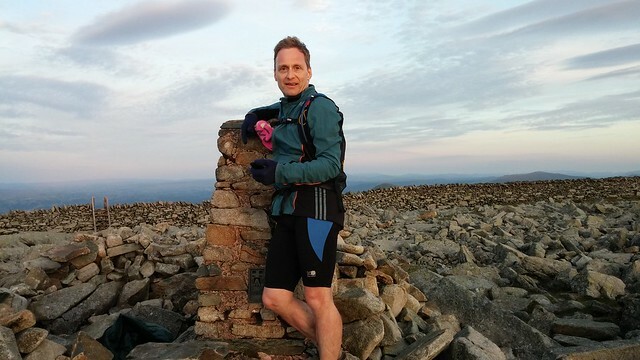 After going up and over Carndedd Ugain we found ourselves at the Snowdon railway track – still deserted – and made it to the summit in a very short space of time, elbowing our way through the crowds to make it to the top at about 06:52. Or rather not a single person in sight. 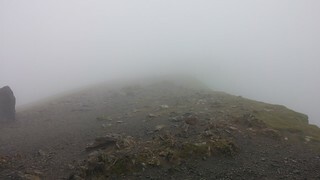 Snowdon Summit, where are the crowds? We decided to follow the railway track a bit more than planned on the way down and made a good bit of speed. However, after leaving the track the descent to Nant Peris was a bit slippy down the grassy slope – there doesn’t seem to be an easy way to cut this particular corner off. We met our support, Gavin, within the estimated time window and I consumed some tea and third breakfast. The second big ascent, up Elidir Fawr, took a few minutes short of 2 hours, by this time the sun was out and it was fleece off, sunglasses on time. Still we had not seen another walker. Descending from Elidir Fawr we were able to do a good bit of speed again and met someone coming down from Y Garn. 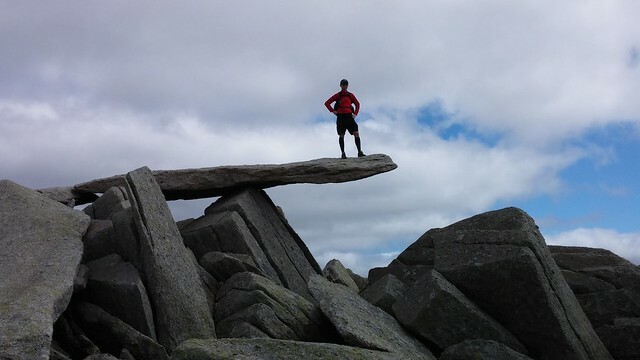 Making our way round the Glyders we saw a few more people and I had the obligatory photo on the Cantilever at Glyder Fach. At this time we were only about 50 minutes behind the nominal 15 hour planned time, however it was now that the problems started. The descent of Glyder Fach is down a highly eroded path with loose stone on top of rather more soil than is usual for the area. As it was dry, it was negotiable slowly, however I think that this would be a bit tricky if it were wet. 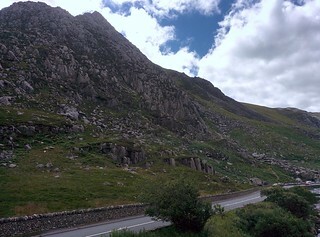 Next we made the ascent of Tryfan at a reasonable speed, though the false peaks were a bit annoying. We made it to the top and rested next to Adam and Eve for a few minutes and to wait whilst a group of boys completed their ascent up our descent path, an impressive performance by them. 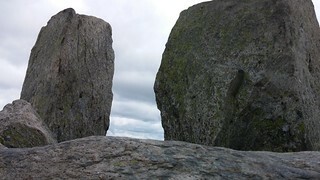 The descent of Tryfan was hard on the legs and seemed to go on for a long time. We had the sun full on us and it was hot. I ran out of Ribena near the bottom, but not that far from the next check point with Gavin, so just about well judged. 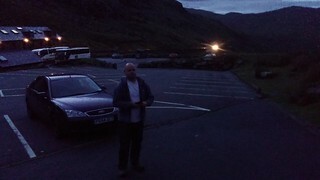 We took some time by Llyn Ogwen to eat and drink and re-stock our bags before starting the ascent of Pen Yr Ole Wen. We knew that if we could get to the top of this one then the hardest work would have been done. We made really good steady progress upwards – the time for the leg was not much more than the “plan”, which was pretty good considering the work already done and with the sun on our backs. I also had to stop to correct a Ribena leakage in my bag as I could’t afford a leakage that lost all my drink. We saw a few people on the top of Pen Yr Ole Wen, perhaps a little surprising given the time of day, and then proceeded to make our way round the Carnedds. There were no technical climbing challenges on this part of the journey, the main problem was now one of fatigue. The plan had been to contour round to Yr Elen and then back over to Carnedd Llewelyn, but a combination of forgetting the plan and not seeing much of a path to our left meant that we ascended them in the reverse order and then cut the corner to avoid a second ascent of Carnedd Llewelyn. Actually, this probably turned out to be a good result. Looking back from Yr Elen the path “along the contours” was easily visible through the scree as it joined the ascent of Yr Elen, but not very visible around the mountainside, we concluded that it may very well have taken us longer if we had gone that way anyway. 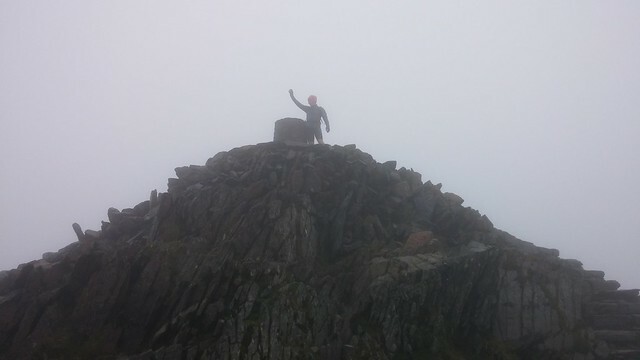 Only three peaks to go now we quickly attained Foel Grach, 20 minutes later Carndedd Gwenllian and then in only another 23 minutes Foel Fras – suddenly we had done it! It was something of a relief that the final peaks as so easy. 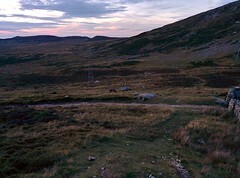 All we had to do now was make our way back to the car, there is no short route off Foel Fras. This took us about an hour and three quarters (perhaps a little disappointing), following the fence line is very easy and safe, no chance of getting lost, so I would recommend this if you think that you might finish in the dark – as long as your driver doesn’t mind the drive to the car park (you may want to let them decide!). We had our torches on for the final few minutes, but this was to avoid tripping more than for navigation as the route was obvious. And so we made it to the waiting car after 29.8 miles and about 18 hours 40 minutes after the start. Not quite a Colin Donnelly record, but a massive success nonetheless. If you would like to see all of the photos here is my set and here is Gavin’s. I also took some video’s, these are rather wobbly as we walked and jogged along, it may take me a while to edit down to something watchable – check back later. The descent of Snowdon from the railway track is tricky, we lost the ill-defined path and it was very slippy after the previous nights rain. Going across the boulders on Glyder Frach, could be speeded up if you had a few hours to work out the best route on a planning trip. 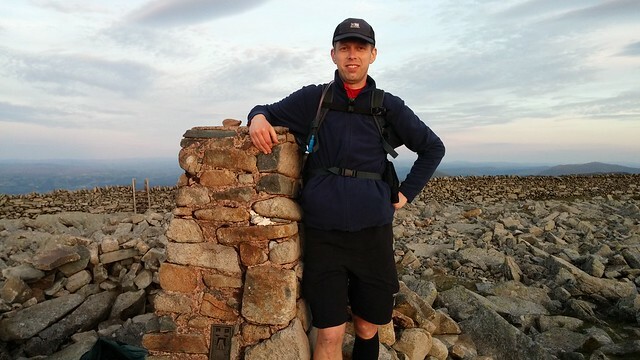 When starting the descent of Glyder Fach, do not follow the exact position of the path on the OS map (as I did), it’s not dangerous, but is steeper than the route in my GPX file (previous post on planning). Our descent of Tryfan was longer than the planned route, but we made the decision on the top that it was going to be easier, which given fatigue was a good choice – I particulalrly recommend the green actual track, rather than the red planned one at this point. 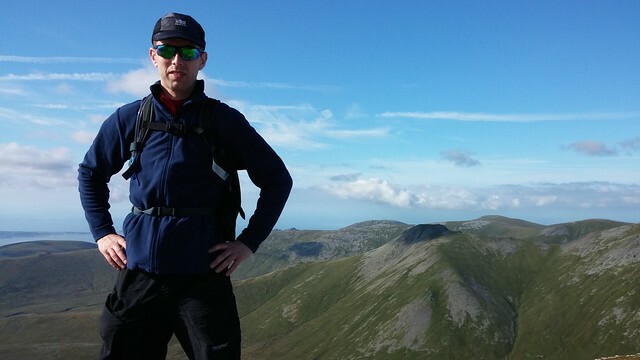 Finally, our route to Yr Elen, whilst requiring a little more ascent, was not that bad and I would recommend it if you can’t find the path that follow the coutours between Carnedd Llewelyn and Yr Elen. I bought a very small £9.99 camera from Ebay which I took on our little trip the other day. A lot of the video footage taken with it was a bit shaky due to the exceptionally high velocity with which Steve and I were travelling, however a bit of it is OK and I have done some image stabilisation on part 1 (I think that it made it more watch-able). Note that the time on the video camera is a few minutes ahead of the actual time. 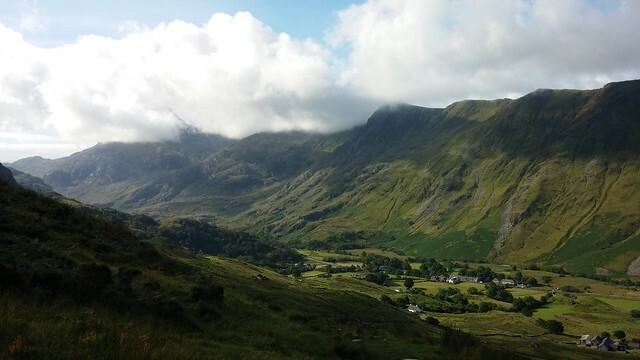 This entry was posted in Fitness, Snowdonia, Uncategorized, Walking on July 16, 2014 by Jonathan.